I was strolling round Nolita on a recent trip to New York and something caught my eye. I peered closer. It looked like a café in a green house, reminiscent of the Palmenhaus in Vienna but like a younger, more BoHo little sister. Intrigued, I headed over. The Butcher’s Daughter. Hummmm. Although I doubted I could eat there, I was pulled in by the design. 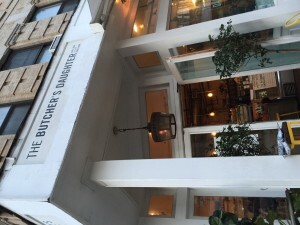 “…a feminine take on an old world butcher shop.” And it’s vegetarian! And it has tempeh! 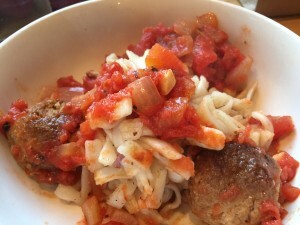 Spaghetti with tempeh “meatballs”! I have been working on a tempeh “meatball” recipe because spaghetti and “meatball” soup with veggies is our traditional Christmas Eve meal, believe it or not. 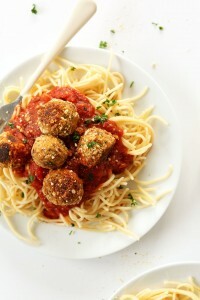 But I no longer want to buy the ready made vegan meatballs – I want to make them with tempeh. I do not have the Butcher’s Daughter’s recipe but I found this one from minimalist baker and the photography is beautiful.